Knit Up & Dye Podcast, Yarn & Knitting Patterns: How Our Garden Grows! John and I have been very fortunate with our garden this year. We have a huge collection of amazing heirloom tomatoes! I have never enjoyed such an delicious variety of tomato flavors - each variety has a flavor unto itself. We are picking approximately a pint of Cherry tomatoes and 3-5 full sized tomatoes every other day. We're quite literally eating tomatoes 3 meals a day! I'm partial to the yellow variety (whose name escapes me) and the Brandywines, but I have been caught eating fistfuls of Cherry tomatoes right off the plant. Last year we lost all of the cucumbers. This year we have cucumbers and are eager to attempt pickles again this year. We did suffer some losses - the zucchini failed all together after a squash bug attack, the broccoli just never got a stable start, and about half of the peppers died in an early heat wave. Our potato boxes produced a couple of small potatoes before failing. We believe this was a irrigation issue, and look to attempt again in the fall. We have plans to build a cold box and start lettuces for the winter months. We may also re-attempt brocolli. 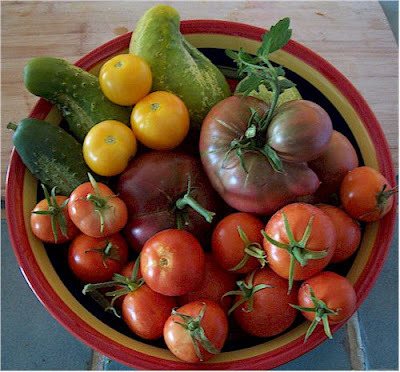 There are several vegetables that grow over the winter here and we are game to give them a try.